One day in January, I saw a promoted ad on Twitter for StitchFix.com. Intrigued, I clicked on the ad, and immediately found out it is a clothing and accessories site for women. Sorry men! Reading further on the website I learned they would send five items of clothing or accessories hand-picked by stylists who work for them to a customer. Once items arrive, the customer is asked to try on the clothes or check out the accessories and choose among them what to keep and what to return. The website stresses that a customer is not obligated to keep everything every time and is charged only for kept items. However, the returns must be shipped back in a prepaid Priority Mail envelope within three business days of receipt or be charged for all the items. I thought this sounded reasonable, so I created a customer account and imputed a gift card I got for Christmas as payment. Once I finished, the site took me to a page to enter my measurements (not sharing) and to choose the size of clothing I wear. After this, the site took me to a page to rate photos of different styles of clothing from casual to very dressy attire. I had to rate them by choosing “I love it”, “I really like it”, “I like it” or “I hate it.” A similar set of questions to these asked how often do I dress casually, how often do I dress up to go out and so forth. Next I was asked what colors of clothing I didn’t want and which clothing materials they should exclude. I chose leather (do not care for except as a coat) and wool (makes me very itchy). Once done with these questions and a few about accessories I reached the last step. I had to choose the timing of each package from every two to three weeks, once a month, every other month or every three months. For my first package, I chose three weeks. The package arrived on February 17th, and I was excited. I opened it and took out a wrap dress in a cool-toned blue with teal zig zags. Second, I took out a taupe top with lace on the front and after that a top in dark blue with teal dots. The fourth and fifth items were a pair of black jeans and a blush pink cardigan with ivory triangles and straight lines. To check the colors of each item, I retrieved Color Me Beautiful Spring color swatches from my purse. The wrap dress and the top were sadly not a match to any shades of blue in the swatches. I confirmed this when I held the dress then the top up near my face as I looked in a mirror – I didn’t look good. The jeans I passed on because I already own four pairs. The taupe top with lace, I thought was too fancy and passed on it. The last item the blush pink cardigan looked perfect. I tried it on, and I looked great! Once I finished, I logged onto the site and gave my feedback on each item I received. I let them know what I was returning, and I let them know what I was keeping. I also filled out a comment box and let the stylists know not to send jeans in the future and told them about the proper colors for me. Then before I logged out, I chose my next box to be sent at the end of June. 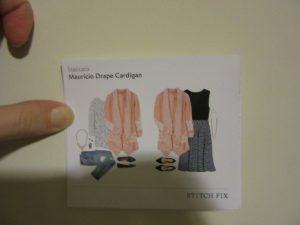 I am glad I gave Stitchfix.com a try. I felt it asked very good questions about what I wanted and what I didn’t want. Yes, the first box only had one item I kept but all the clothing items looked like they would have fit me. Plus most of the prices for the items were reasonable except for the jeans that were $98 which I let Stitchfix.com know was too high. I look forward to my second box, and maybe I can stretch my gift card to a third box before deciding if I will stay with this website or not.